The Farrer family of clockmakers are numerous and a very complicated group to understand. They began in and around Pontefract, where they mostly worked, though there is indication that the first Farrers learned their trade in the Halifax area, perhaps under the Ogden family. The first Farrers, Abraham and William, were working in Pontefract by the 1690s. Their relationship to each other is not known, though Abraham might just have been William's father. These were no country clocksmiths. They were highly proficient, fully conversant with the best London practices and styles of the day and were quite capable of making top quality clockwork. They were followed by three or perhaps four more generations each with numerous practitioners of the craft. Farrers were making and selling clocks in Pontefract until at least the 1870s and perhaps later. The clock described here, which came to light recently, is signed 'Chas. Farrer Doncaster' and is a reasonably straightforward one to identify and date as there was only one Charles and only two clockmaking Farrers worked in Doncaster before the mid nineteenth century. Many Farrer clocks are signed just 'Farrer Pontefract', which leaves several possibilities as to which member of the family made it. Charles Farrer was born about 1761, probably at Pontefract though we do not know his father. He married in Doncaster in 1790 to Ann Cookson. He died suddenly at Pontefract in 1817 at the age of fifty six, probably on a visit to his family. His widow lived on at Doncaster till 1842, when she died aged 76. Joshua Farrer, born at Pontefract about 1771, also worked in Doncaster and was probably the brother of Charles. Joshua died in 1838, his widow in 1845. 1. The mahogany case has many features of its period - French feet, three-quarter-length door, canted trunk corners, yellow stringing. Click for closer view. 2. The fourteen-inch dial has no dialmaker's name or falseplate. It clearly dates by its style from about 1800-1810. Sporting scenes on a dial of this age are very unusual. This clock was made between 1800 and 1810, just at the start of the new century. The fine mahogany case still retains the elegant lines of eighteenth-century long-door work, but is not quite so slender, and the trunk door has begun to shorten slightly into the type we call a three-quarter-length door. The feet are cut integrally into the base (rather than being a separate addition, like earlier clocks) and have a slight outward sweep in a style we call French feet. The dial too tells us something about the clock's age. The dial is fourteen inches wide. An eighteenth-century dial is usually twelve inches, but broader dials were used when more scope was wanted for pictorial scenes, as here. It has the distinctive look of a Birmingham dial but fits direct to the movement by three dial feet with no intermediate falseplate and no dialmaker's name is evident. The numbering pattern of Arabic minutes marked at every fifth unit outside a band of Roman hours was the pattern of the eighteenth century from the very start of painted dials. But on this example the minutes are numbered only at each quarter hour (15, 30, 45, 60), dropping the intervening minute numbers. This is a typical feature of the first few years of the nineteenth century. The seconds dial is also numbered every fifteen seconds instead of every ten, as was normal in the eighteenth century. Increasing familiarity with clocks meant less need to spell everything out in detail on the dial. 3. 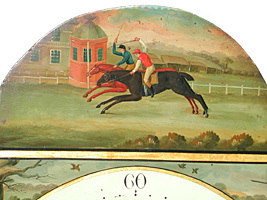 The arch shows a horse race in progress - exceptionally unusual on eighteenth century clocks but particularly appropriate for Doncaster. The clock is an eight-day clock but it lacks the calendar feature which most eight-day examples have above VI. 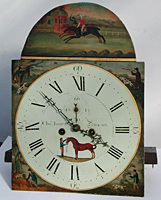 Instead that space has been used for a racehorse and groom - a very unusual scene on any clock. Most eight-day dials were supplied with four dial feet and a calendar function, which is what most eight-day movement were built to drive. The implication is that the maker here ordered a thirty-hour dial modified for eight-day use. When we look at the movement, a well-made one with unusually slender and daintily-knopped pillars, we see Charles has made this movement specially. It is not just a standard eight-day movement on which the calendar drive pinion has been left unused - which is what many a clockmaker would have used. This clock has no calendar drive pinion, which means it was made purposely for this calendarless dial. The subject matter for the dial is very interesting. Racecourse horse racing is exceptionally rare on clock dials - horse riding in the form of foxhunting much less so. So we can deduce that this clock was made purposely at the request of a particular customer, a local 'sporting' gentleman. Those who are shooters are often obsessed with it and this client was no exception for he ordered shooting scenes in every corner. Pheasants are said to have been introduced into Britain by the Romans. Pheasant shooting was always a popular sport on a gentleman's estate or farm. It combined the pleasure of the hunt with food for the pot - and the challenge of avoiding the lead shot when chewing it. The gun, the dog and the pheasant were favourite pastimes for many a country gentleman - hence the many taverns named after them, which were probably his next most favourite pastime. When this man was not following the horses, his gundog was following him. Such sportsman's clock dials were very popular in the 1840s and later, but by that time clock cases had become broader, which reduces the appeal of many such clocks today. Modern shooters love these dials, but not the broad cases. Eighteenth century cases kept the slender lines but sporting dials at this period are very rare. This clock offers a happy compromise with a restrained case and a high-demand sporting dial.